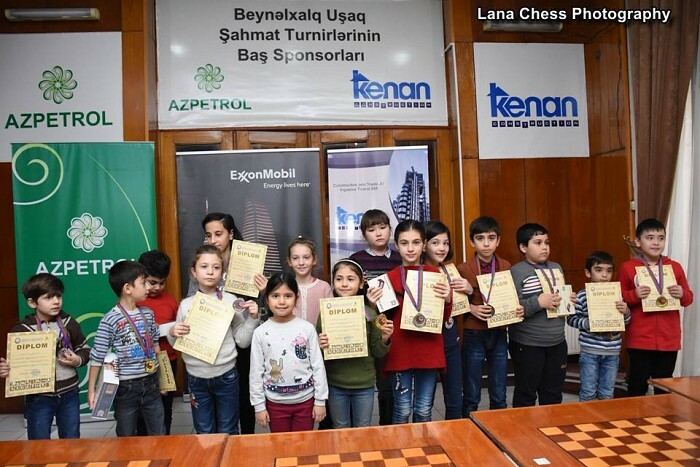 On November 17-25, 2018, the children’s tournament of the international chess festival was held in the Republican Chess Centre (Club). 78 athletes (17 people out of them are girls) representing Kazakhstan and Ukraine participated in the tournament held among boys and girls born in 2008 and younger along the athletes of the capital city and regions. The tournament was held on a Swiss system consisting of 9 rounds. The games were run by a board of judges headed by international referee Nurali Mammadzada. Among boys under 10 years old, I place was taken by Assylov Miras (Kazakhstan) with 7.5 points, II place by Davudov Tunar (Baku) with 7.0 points, III place by Tarverdiyev Rasul (Baku) with 6.5 points and among girls under 10 years old, I place was taken by Nuriyeva Nurtan (Sumgayit) with 6.0 points, II place by Abishli Zhala (Sumgayit) with 5.0 points, III place by Heydarova Azada (Baku) with 4.5 points and among boys under 8 years old, I place was taken Shakaraliyev Elchin (Sumgayit) with 7.0 points, II place by Karimov Nihad (Goychay) with 7.0 points, III place by Karimli Yusif (Shaki) with 6.5 points and among girls under 8 years old, I place was taken by Huseynova Lala (Baku) with 5.5 points, II place by Huseynli Ayan (Baku) with 4.5 points and III place by Huseynova Firangiz (Gazakh) with 4.0 points in the tournament. Solemn closing ceremony was held after the last round. Faig Hasanov, Vice President of the Azerbaijan Chess Federation, international referee, Majid Afandiyev, Director of the Republican Chess Center, Nurali Mammadzada, chief referee of the competition, international referee, Ulkar Umudova, international referee, Sattar Mammadov, a representative of Azpetrol company which is an official sponsor of the tournament, Aygun Tanriverdiyeva, a representative of ExxonMobil company and Elmira Aliyeva, a representative of Kenan company, participated in the tournament. Salman Abdulov, a responsible employee of the Baku City Chief Department of Youth and Sports, the coordinator-curator of the chess sports of the capital, opened the event with an introductory word and presented the event participants after giving detailed information about the competition. Faig Hasanov, Vice President of Azerbaijan Chess Federation, international referee, made a speech and congratulated the participants of the event and wished success to them in future competitions. 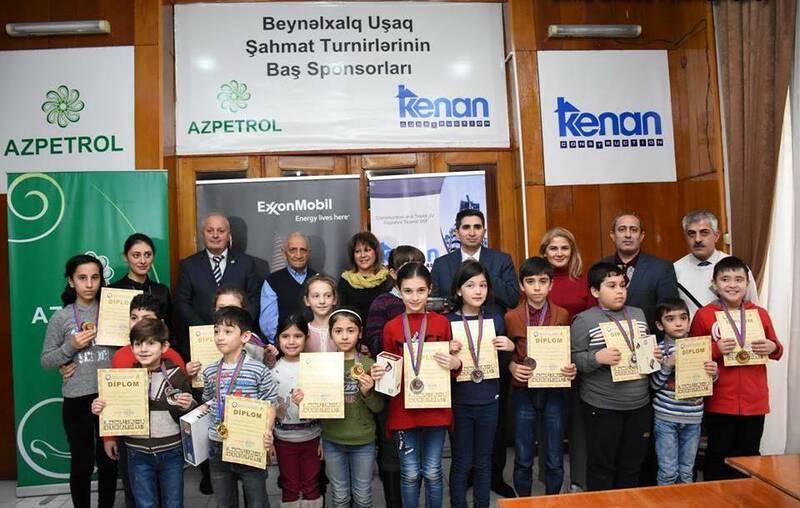 Finally, the winners-Eldarli Suleyman (Baku), also the youngest boy chess player of the tournament, Bakhishova Maryam (Baku), the youngest girl chess player, as well as Kamasheva Manshuk representing Kazakhstan and Timchenko Mariya representing Ukraine, were awarded by various degree diplomas, medals and precious memorial presents. We congratulate the winners!